The Urban Politico: Recession? What Recession? Black Friday in America has traditionally been pretty ridiculous over there years. People have literally trampled over each other -- even killing one another -- to get the latest sale on [insert whatever here]. How has corporate America responded? Have they put out public statements cautioning people not to trample over their neighbors as they race to grab that flat screen TV? Have they attempted to, perhaps, add extra security or safety features in place? Have they attempted to cancel or postpone the whole "Black Friday" phenomenon altogether out of a concern for public safety? Nope. Corporate America's response? Why wait for Friday for all the madness to begin? Let's start the clock on Thanksgiving night! Wal-Mart opened its stores at 6 p.m. this year, two hours earlier than last year and smack in the middle of most families' Thanksgiving dinners. So what does one of its top executives have to say? CNNMoney spoke with Wal-Mart's CEO Bill Simon. Simon: Our job is to try to anticipate what the customer wants... Having families out, children in the building... gives it a different feel. And it's one that's in line with who we are at Wal-Mart. It feels a lot better in the evening than it did when it was early in the morning [on Black Friday]. 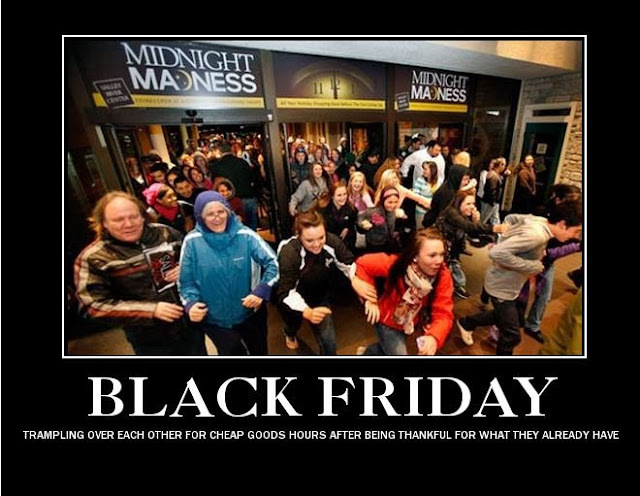 Do you wrestle with the moral implications of [opening on Thanksgiving]? Simon: We had planned not to move [the opening time] this year, but the market moved... I have a hard time imagining it could be 4:00. Let's hope that it doesn't move. Are you willing to draw a line? Simon: "We've seen about as early as it can go. It's hard to imagine that it can move much more." Simon said he worked throughout most of the night, staying up by sipping coffee and downing a Monster energy drink. He noted that the company provided the 900,000 employees who worked on Thursday with a hot meal and extra pay -- plus a 25% corporate in-store discount for their own holiday shopping. I'm not sure which is worse, the greedy masses of people racing out to the stores to save a few bucks on Christmas shopping, or the corporate executives like Bill Simon who encourage it.